LAS VEGAS — The Las Vegas Metropolitan Police Department released Wednesday the final batch of the October 1, 2017 Las Vegas Massacre records. Whether all the records in the possession of the LVMPD that they were ordered by the court last year to release, have actually all been released is anyone’s guess. 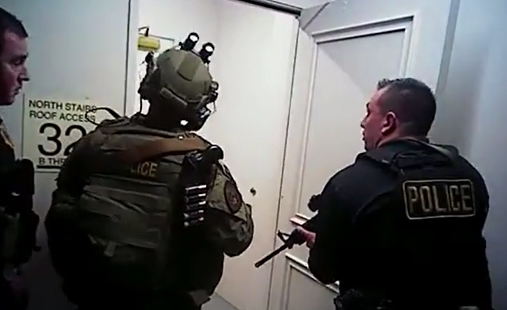 Among the documents that were released was the transcript from LVMPD SWAT Officer Levi Hancock’ tape-recorded interview that was conducted by detectives from the Force Investigation Team on October 3, 2017. Leavitt: Can you describe to me what you were wearing the night of the incident? Hancock: I was wearing a similar type uniform, some combat pants and a combat shirt along with the boots I wear for normal duty. I also had a gun belt on, actually this same gun belt on with two thigh rigs, with a Glock 17 on the right hip and extra magazines on my left hip. Then I had my heavy vest on with my natural complement of ammunition, magazines, explosive breaching components, a helmet and also a M4 [rifle]. Hancock: Yes, extra restraining devices, I got a low lethal on my kit and that’s pretty much it. Leavitt: We’re gonna talk about an active shooter that you responded to at Mandalay Bay hotel. Can you just kind of explain to me how you became aware of the incident that was unfolding and were you currently working, how you got there, that kind of thing? Hancock: I was currently on shift, we had worked a little bit earlier. I had gotten a text notification from my sergeant, Todd Mueller, he said that there was an active shooter at Mandalay Bay, the communicator would be coming out – Communicator is our system for notifications, but everybody to be en route. I went en route, I was up on the Spring Valley side of town. I went en route code [lights and siren], started immediately, flipped over to Convention Center [radio channel] just to try and get a gist of what was going on. I hadn’t gotten any information outside of the text that I received. The communicator still hadn’t come out, and when it did eventually come out, something happened with it, there was no real intel on it, it just said that it was a test of the communicator system. I had originally flipped over to SWAT1, to say that I was en route and then also just to get any updates, any information that was coming out there. But most of it was just all the SWAT guys saying that they were up en route, discussions about who was picking up armor, those kinds of things. I flipped over to Convention Center to get some real-time info and that’s when I heard obviously the chaos that was going on over there. As I proceeded down, I actually was going eastbound on Russell from the 215, I’m like I’m going code run. They started to put out traffic that nobody should come to the east side of Mandalay Bay because apparently, that’s where shots were being fired. So as I got closer I was going Russell, I just decided to go over to Hacienda and make that my approach to coming into the area. Knowing that Route 91 area was being affected that was over closer towards that Hacienda intersection of Las Vegas Boulevard and where Mandalay Bay is at. So as I started to traverse down there I could hear units saying that they were taking gunfire up on the 32nd floor. And out of all that traffic that was going on that I deciphered that was the only place that we had actually pinpointed where gunfire was being – was coming from. It sounded like everything else was going on in the Strip. We weren’t quite sure where anybody – nobody had identified a suspect at ground level basically. So having that information, I arrived just outside of the Michael Jackson Theater, People were evacing out of the tunnel that goes across to Luxor right there as well and coming out some of those doors. I proceeded to get dressed out, putting on my respective uniform like I told you that I was wearing. Kitted out also, I’ve got an active shooter bag that I roll with and a manual breaching device as well. Slung on all that, proceeded to get up on the SWAT simplex channel and realized there was nobody else on the channel because nobody else was there yet. I flipped over to SWAT1 and there was still traffic going on, but they were saying that the stage area for SWAT was going to be over by South Central Area Command. At that point I made the decision, listen I’m already here, I’m already deploying, I’m not going to redeploy to across that area, it’d just be too time-consuming and cumbersome to get there. Plus, with the radio traffic that I heard, units upstairs were taking fire up on the 32nd floor. So not being – literally I was there by myself, there’s no other police there, I just – civilians that were evacing out, I asked people, “Hey where’s the quickest entrance to get inside?” And they pointed me basically right to the Michael Jackson Theater. I came in the back door and was right there. Decided to go ahead and deploy myself, figuring that I was going to pick up somebody along the way, probably some SWAT guys or whoever else was arriving. So as I walked through the theater, I came across the corridor that runs into I think it’s the Delano [hotel] right there and I was clearing it just kind of scanning left and right. I picked up a patrol unit that was down about 50 yards to my left. I immediately notified them, “Hey SWAT,” and proceeded to move up to where they were at. As soon as I got up to them and I couldn’t even tell you who they were, at that point in time I just knew that there was three patrol guys, I said, “Hey you guys are with me.” So we proceeded to go through the casino. I knew where the elevator bank was to get upstairs so we went through the casino and got over to the elevators. When I got to the elevators that’s when I came across, I think it was Sergeant Bitsko and Dave Newton, and I started talking to them about a plan about getting upstairs. We started discussing the 32nd floor, what we – at least what I knew at that point in time and then we realized that the elevators were locked out, apparently they had locked them out on their egress out of there, the maintenance guys had locked them out completely. So I had two options, I could take the stairs, or I could wait for a second and see if it was going to be beneficial for me to wait and get keys to the elevator. So, I told those guys, “Hey listen we’re going to wait just a minute to see if we can get keys,” and literally within I would say maybe a couple minutes at the most, one of the security guys showed up with some keys, got us into the elevator and finally got us moving up to the 32nd floor. I had a contingent of guys, you know, obviously there were – at the elevator possibly six of us going up, so we got up to the 32nd floor. As the elevators opened we just quickly cleared that immediate area and then exited out of the elevator, we peeked that we could see a whole contingent of officers in the rotunda area. And they were pointing guns down to the north wing and they were set up. So went over to start getting intel from them and immediately they started telling me, “Hey he’s been firing with a belt-fed machine gun, and they insisted it was belt-fed machine gun. That’s just kind of what resonated in my mind. And they had one patrol guy that was basically proned out on the floor in the middle of the hallway pointing his rifle downrange. 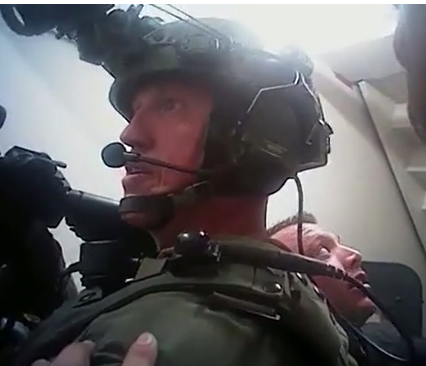 I told those guys, “Listen, get that guy up off the floor,” he was in areal bad position especially knowing that we had rounds that were coming out of that door. I could see the doors that they were pointing to, they were directly at the end of the hallway, they were double doors as most suites there are. I had made the decision at that point that I was going to bound up to where they were at. I believe it was Sergeant Matchko who was in that rotunda area and he actually started to crawl up there right before I started to bound up. I made it two bounds and then I got into the alcove and I started thinking, it just dawned on me that my previous experience, I had been in Special Investigations and if you guys are aware we’re responsible for the fireworks displays that are going on in the casinos and they’re always on the rooftops. So, I had been in those stairwells before and I knew that they were at the end of each respective hallway. So I decided to back out of my position where I was at there and get a team together, that I could go down to the 31st floor, go down to the stairwell and then proceed to come up through the stairwell. I didn’t remember exactly where it was going to put me out, I just knew it was going to put me out obviously a lot closer position then where I was, and I wouldn’t have to be worried about taking gunfire coming down the hallway. So, put that compliment together including I know Sergeant Bitsko was there, Dave Newton and a few other patrol guys. I took a contingent of officers with me and we proceeded to go to the 31st floor and then traverse that hallway all the way to the north. Well, luck had it that it actually spit us out right next to the suspect’s doorway. So as we breached that door at the 31st floor into the stairwell, we had gotten some information there were some officers along with I believe two patrol officers that were maintaining that stairwell. So obviously we identified ourselves, went through the stairwell and we proceeded up to the 32nd. There are fire doors and I felt pretty good about our position we were in just because just having a basic knowledge of construction the way these high rises are constructed, knowing we had pretty heavy concrete walls for them, not only elevator shafts but the stairwells as well, we had some good cover being where we were at. Initially, I had talked to, when I was up on the 32nd floor I had talked to Maintenance who was out there and he was an engineering guy about shutting down all the power to the 32nd floor, at least it would give us some concealment to go up there. Then getting up to the stairwell on the 32nd floor right next to the suspect’s room I opted to direct a couple of the patrol guys to start talking out lights in the stairwell, that way if we did have to open that door up we wouldn’t have just telegraphed our position to where we were at. So we did that prior to opening the first set of doors that led into the little alcove that leads into another door that goes actually into the hallway. So we took the first set of lights out, breached that door which actually had been come to find out screwed shut. So we used my pry tool, opened that door up and then went into that little alcove area. I assigned the two guys again to take the light out above us, prior to us opening that door. So as we did that I kind of pushed everybody back down the stairs a little bit. I didn’t want everybody just sitting right up on top of the stairs in case we did start taking gunfire, knowing that the construction for those walls is different than what’s in that stairwell. So I pushed the majority of the team back and then it was just myself, Sergeant Bitsko and Dave Newton that were literally in that small 4X6 area right there right before you go out into the hallway. We cracked that door and I started to peek it and realized that it was interesting because there was a room service cart that was right across the hall and immediately I noticed that coming off the room service cart there were multiple wires that ran off the top of the cart, down the side and into the doorway of the adjacent room, literally just right across the hall from us. My initial thought was okay IED [Improvised Explosive Device], pretty odd to see electric wires on a room service cart. So I told Dave to get as low as he possibly could in our little alcove area close to the ground so he could start peeking up underneath where the linens were hanging over the room service cart to see if we had anything that was concerning as far as an IED goes. He couldn’t see anything. The most we could tell the electronic wires terminated to some smaller devices no bigger than your fist. We just didn’t know what it was at the time. I got down and peeked it while they were holding our position on the door and I just didn’t see anything that was really concerning. I told those guys, I said, “The size,” you know even with that going on, even it was an IED we still got this guy that’s an active shooter in here, we need to at least move forward. So being in that position, we identified that, come to find out later it was cameras that he had set up. I told Sergeant Bitsko and Dave Newton that I was going to hang an explosive breach on the door. I believe at that point in time with all the radio traffic and everything else going on, Lieutenant Huddler had gotten on Convention Center because I had stayed on Convention Center because I had gotten no radio traffic on SWAT simplex, I wanted to still get that live update, live intel, real-time information on Convention Center, and I hadn’t really heard any other SWAT guys on SWAT1. Lieutenant Huddler had actually gotten on the air and said to call him. So I called him and immediately told him, I said, “Listen I’m going [redacted] and I’m going to blow it right away. We don’t know if this guy is still in here.” And at that time we had multiple reports of active shooters coming from different properties. So not having heard any gunfire myself, my concern was that this guy was even still inside, that maybe he had the possibility of egressing out somehow or if we had multiple active shooters we needed to make sure we could deal – get this done with so we could redeploy and push assets elsewhere. Obviously with the charge that I had my concern was overpressure. I didn’t want the overpressure to tweak our doorframe and have us then have to have a door that was shut that we weren’t able to get through, especially given circumstances. So, we did that, we propped the door, didn’t really prop it, we just placed the shield inside the door, shut the door pretty much as we could. And then we backed into the stairwell, fully anticipating that we were going to get gunfire as soon as we popped the charge. At that point, I was able to actually get on the radio and tell Dispatch that we had placed an explosive breach on the door, that we were going to pop it, what our plan was to try and get a response from this guy to see if he was even in the room. I think that was the biggest concern like I had said before we – I hadn’t physically heard shots myself outside of what everybody was telling me. So, went ahead and put that traffic out over the radio, plus I wanted the officers that were in the hallway, I wanted them tucked back as much as possible because that overpressure in closed areas got one way to travel and it’s going to traverse the entire length of that hallway. So that was my other concern as well, I wanted them to be able to take some cover. So as soon as we did that she announced it again over the radio and then Dave came upon the channel and said, “Stand by for breach. Breach, breach, breach.” At which point I had initiated the plunger into the initiator and let the breach initiate. The breach initiated and we didn’t get anything, like we had really anticipated, at that point. 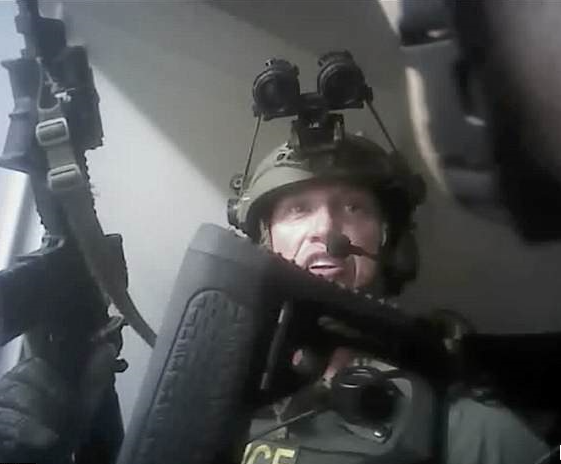 So I told those guys that we’re going to hold, in SWAT time maybe it feels like a long time, but we held for maybe 30 seconds and after we didn’t get anything. I actually low crawled and kind of peeked that corner just kind of cutting the pie a little bit outside of that door that went into the hallway and saw that we had a positive breach on the door. The door basically had breached, and it was hung up on the return, the mechanical return that’s on the high portion, the high corner of the door. So it was just sitting at an angle from, one corner down but it still allowed me to see in from the top portion of the door and the bottom portion of the door and it actually gave us what we consider a positive breach because we could’ve made entry through it if we needed to at that point in time. So if seeing that, and we hadn’t gotten the response we had anticipated, I opted to really take it slow as possible. What I didn’t want to do is create a situation with the officers who I designated that were going to go in with us, they don’t have the experience in conducting a controlled entry or a dynamic entry into a structure. Where that maybe would have been beneficial having more SWAT guys with me, especially having this, you know, speed, surprise and violence of action, and being able to dominate that structure I knew that the guys behind me didn’t have the same training and experience that I had so I opted to take it as slow as possible. So as I slowly pushed out into the hallway I started to just slowly cut the pie on that door, I wasn’t getting any movements, seeing anything inside, so I actually pushed across to the right side of the hallway. And we were at the point where we could now just take the working side of the door and just push it open because it wasn’t latched to anything at that point. Dave was covering – I think it was Dave that was covering the left side of the doorway and we were just covering deep into the room. We weren’t hearing anything other than just wind and drapes that were kind of going on in the background. So I told Dave that we were going to go ahead and made entry and we just slowly kind of just started to kind of slow and methodical search. We came to a hallway that was to my immediate right, I ended up taking that hallway, it was like a kind of wet bar, type hallway access that was right behind where the bar itself is that faces out into the room. So I took that hallway and Dave and some other personnel pushed forward into the main living room area and started to clean up that area. As soon as I made it down the hallway I was clearing left to right where it juncture into another little sitting area and I could immediately see what I believed to be the suspect with his head pointed towards our direction and you could tell he some type of wound to his head, he was incapacitated on the ground, on his back. At that point the other officers that had been clearing that area started to push forward so my concern was to my right, wasn’t sure what we had, and I knew we potentially had that whatever it was, a device or something else that was in the hallway that was connected to something. So as I peeked that corner to the right, I saw that that was our, through doors that would be going to an adjoining room. One door was completely open as much as it could be, I think it was hitting against the couch. At which point I noticed the other door was closed and it didn’t have a – there’s no handle. Obviously, those handles have to be open from the other side. I thought it was a little odd that that door was closed, especially with a suspect being in that room. So I actually kicked it twice, to see if I got any play on the door itself to see if I could breach it, and I was getting nothing. Looking at the door, realized this is a heavy wood door on a metal frame, there was no way that I was going to physically be able to do that. And then my other concern was do we have additional suspects, especially with the closed door. So I told everybody, I said, “Hey pull back, we’re going to pull back around the corner and I’m going to place another explosive breach on that door.” Besides, after having kicked it myself I didn’t want to put somebody up there, I also had a shot-loc as well but not being able to see where a door handle was I’d have to go to the hinges and that would take multiple shots and that would also put me right directly in front of the door in case there was an additional suspect inside. So I pulled everybody back towards the front doors where we had entered and prepared another [redacted] I got off my vest, prepped it and then as we moved forward I had Dean O’Donnell in the room with me who had actually apparently been deep in the hallway, with two other SWAT officers that were our sniper units, that were on gun covering the hallway. So I told him to stay on the gun right on the corner, that I was going to prep the [redacted] and we’re going to go up and hang it. So as I prepped it we moved forward, I pushed him to my right so I could get up close to where I thought the hinges would be and I started to hang the [redacted] on the door. I hung it and then I whispered to him that we were good, and I started to move back. And I told him as soon as I moved back this thing is going. So as soon as we got back I grabbed the initiator from the patrol officer that I handed it to and inserted my plunger and then initiated the [redacted]. We got a positive breach on that door. As soon as that did happen we had an accidental discharge on that, I’m not sure if you guys were aware of that or not. Apparently, Sean from what I gathered had put his gun on select fire and then had the accidental discharge. I asked him if he had seen anything, obviously, that caught me off guard. He said, “I thought I saw something,” and there was – as I peeked the corner, we just had a lot of smoke from the explosive breach. So, looking at that, I said, “Okay well let’s go ahead and make entry, so we went up to the door, we just kind of did some peeks and looked at it, we didn’t get engaged or encountered by anybody, didn’t see anybody in the immediate area so we just kind of fluttered into it. As we pushed forward into that room I held on the bathroom while he pushed left because all we had to the right was just a hallway. So he pushed left and then that’s when we also saw that was where the other shooting platform was where the window had been broken out. He cleaned up behind me and then came up, tacked me up and we proceeded to go in and clean the bathroom up. At which point we determined it was secure at that point. I went back out into the main room, I assigned guys, I think it was one of the K-9, I think it was Dave Newton along with patrol guy to start doing re-checks. What I mean by re-checks is, checking under beds, making sure we don’t have anybody hiding anywhere. So they were doing re-checks at which point I came across the air on the radio channel, said that we had secured the room and we had the one suspect down. And that’s pretty much it. Once re-checks were done and it was secure, I identified a couple of patrol officers along with Matchko and said, “Hey listen this is your scene now, we’re going to go ahead and, because we still have reports obviously that were ongoing out, amongst the Valley so we decided to turn it over to them and go down and redeploy. Entry into Stephen Paddock’s suite was made at 11:20 p.m. on October 1, 2017, over one hour after the last shots were fired. Clark County Sheriff Joe Lombardo who runs the LVMPD has yet to explain to the public why it took so long for officers to enter the suite which was contrary to statements he himself has made to the Las Vegas media which he was never challenged on. Other documents that were released on Wednesday are currently under examination by the Baltimore Post-Examiner and we will have additional stories when our analysis is complete. Does anybody else see a problem with DA Mercer and her continuous unethical behavior with cases? NV Supreme Court Judges coudn’t make this crap up. She has continued to cost the taxpayers money and that was apparent with Ocean Fleming case. Now 2 more cases. How many more are going to come forward before Wolfson fires her. Lasvegasnow.com is on her unethical behavior in 2 more cases. Wolfson is trying to have it heard again. They both need to resign. Crooks!!!!! Please read the following story at News 8 now on Liz Mercer. That is who should be being attacked for her behavior.